Heavy traffic, extra Look out posted, hours of darkness. Suddenly the GPS is gone !!! Ever experienced this ? Believe me when it happens, you start doubting each and every equipment. Even the ones which may be working fine at that moment. Is the gyro giving correct heading ? Is the echo sounder showing correct depth ? You will doubt everything !!! That’s not good. You will loose the sense of direction. And you would have tiny amount of time to regain the sense and act in a way that is right. The entire navigation depends upon knowing the position of the ship. This is one of the most important task of a navigator. But when I say position, I do not only mean GPS position. There are many other ways of plotting the ship’s position. And as with the situation of GPS failing, we must be ready to switch to other methods of position fixing. Before we proceed with discussing these methods, I must discuss a term which is so much a part of passage planning. The term is “position Fixing Interval”. “Position fixing interval” is the maximum interval between two position fixes. So if in a particular section of the passage, we have agreed to the PFI of 01 hour, we must plot the ship’s position at least every hour. But how do we decide the position fixing interval ? For that just think why do we need to plot the position ? We plot position to be sure that we are on our track and not drifting towards a danger. With that logic in mind, let us take an example. I plot a position at 0800 Hrs. The agreed position fixing interval is 30 minutes. Now just after 0800 Hrs, the vessel starts to draft directly towards a danger. I will only come to know about that at 0830 Hrs when I plot the next position of the ship. If at 0830 Hrs, vessel is at the danger then the PFI was set too high.Because before we could know that we are running into danger, we already were at the danger. 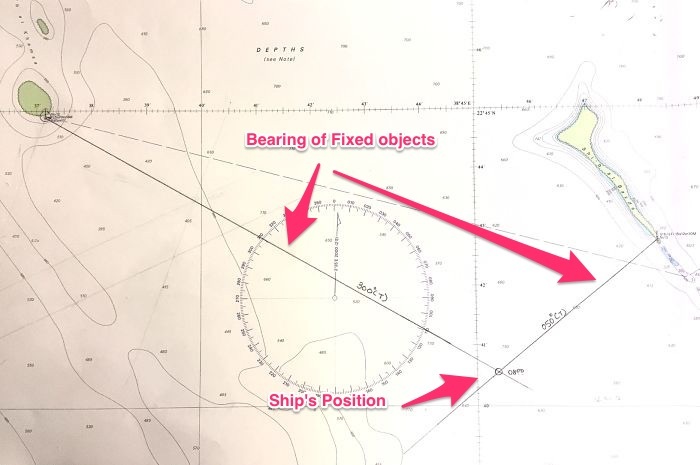 So even if vessel deviates from its course, the interval between two consecutive position fixes should be such that allows time to take the course corrective action. One of the element of passage planning is to identify the primary and secondary method of position fixing at each leg of the passage. There should always be at least two method of position fixing. Now at open sea, the primary method is GPS and secondary method would be “celestial fix”. 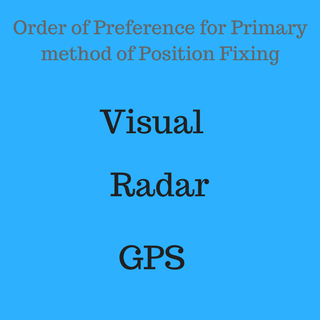 If there is a radar conspicuous object, the primary method of position fixing becomes the “radar fix”. Secondary in this case would be GPS. Now if that object is also visible, primary method becomes the “Visual fix”. In this case secondary method will be “Radar fix”. The idea is that Visual fix gets the highest priority followed by radar fix. And radar fix gets the priority over GPS. On tankers the vetting inspectors expects that if available visual and/or radar fixes must be plotted at least for the PFI. This is considered to be wrong and would draw a vetting observation as the radar/visual position is plotted after 20 minutes where as PFI is 10 Minutes. 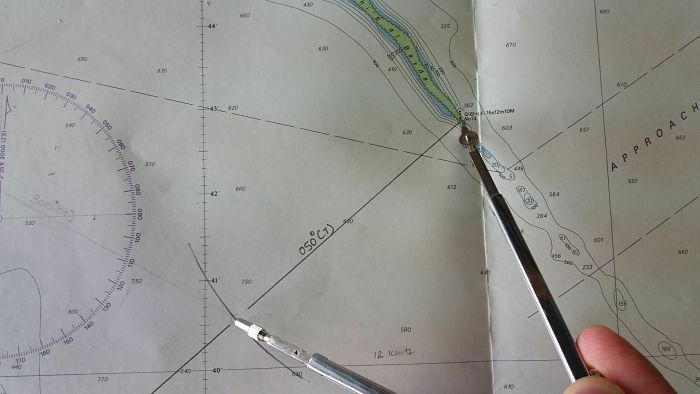 This method is not so popular during coastal navigation because of few reasons. One because this method requires some time to know the position because of calculations involved. Second because there are chances of user induced error (like error in taking the sight). That may not be so nice when ship is navigating in the proximity of dangers during coastal navigation. But there is a gross misconception about this method among many seafarers. Misconception is that position by celestial observations are not accurate. Instead, if we can have our hands set perfectly to take accurate sextant altitude, the position obtained by this method are quite accurate. There are few disadvantages with this method. Even though this method do not rely on electronic equipments and satellites but it need nature in our favour. We need clear sky and clear horizon so that we can measure the altitude of the celestial body. Even when the sky is clear, it is difficult to measure the sextant altitude when ship is rolling. “How to use sextant to get the ship’s position” is too big a topic to fit in this post and I will write on that in detail on some other day. Do I need to say anything about GPS fixes ? Even the supernumaries on board know how to plot GPS position. This is most over relied method of position fixing. Over relied for a good reason. It is Crisp accurate (most of the time) and quick fix. 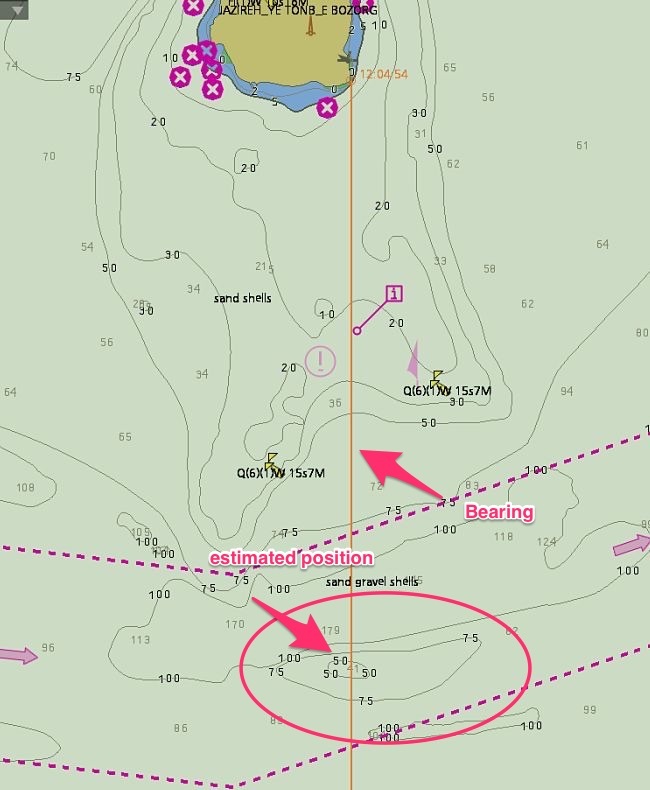 On Modern ECDIS, navigators do not need to do anything in plotting the GPS positions. These are plotted automatically at the set interval. Some ECDIS can even record the ship’s position when it senses change in any parameters like change in course. 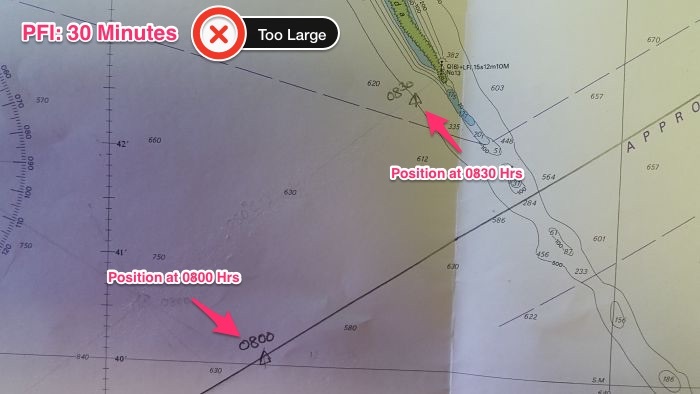 For the passage planning we must ensure that PFI is set in the ECDIS, so that GPS positions are marked and recorded automatically in the ECDIS. 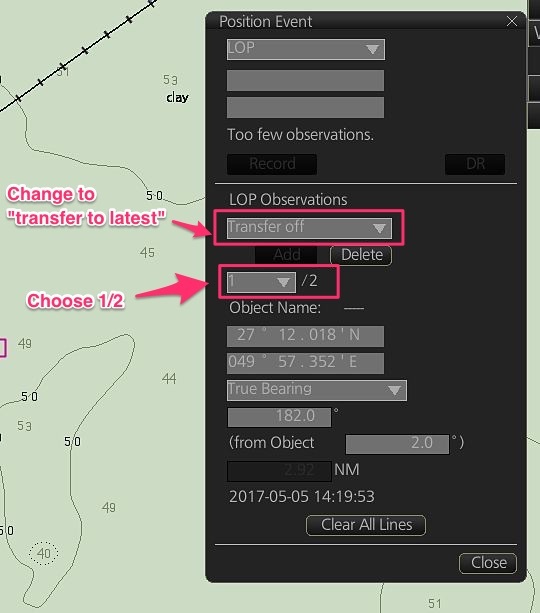 To set the PFI in furuno ECDIS, go to DISP -> SET -> and then choose Symbol DISP. Now go to Tracking. The Position fixing interval can be set under Labels. Once set, the GPS position will be recorded at the mentioned interval. GPS fixes are accurate, no doubt about that. The only issue with GPS fixes is the Complacency and over-reliance. Over-reliance to the extent that we may find ourself unconfortable if the GPS fails. Position by radar gives quite accurate results and must be used whenever we have radar conspicuous objects. The advantage with radar fixes is that it just needs one object to get the ship’s position. We can get the range and bearing of this object and plot the same on the chart. For example let us say we get the bearing of this light as 050 degrees and range as 4.4 NM. We will draw a line of 050 degrees to this light. We will then measure 4.4 NM on the compass and cut the bearing line with this distance. 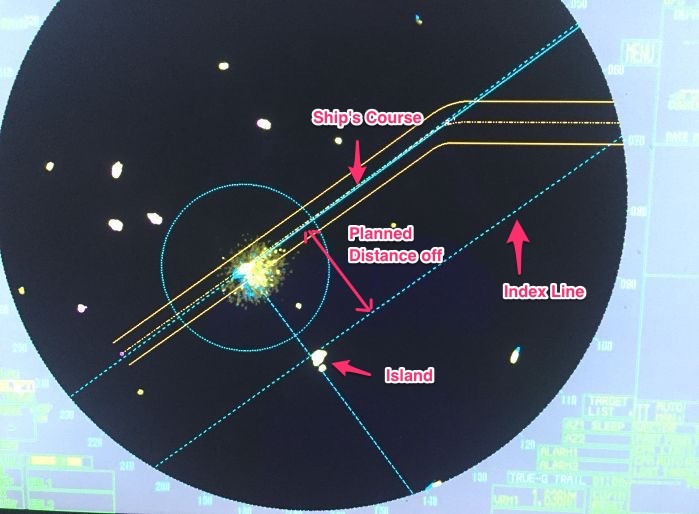 As more and more ships are moving to the paperless navigation, we must know how to fix the ship’s position by radar on ECDIS. So let us fix the ship’s position on Furuno ECDIS. Let us say for this island, we get a bearing of 010 Degrees and distance 2.5NM from the radar. On Furuno ECDIS go to Record -> This will open a position event window. Choose LOP and then choose True-bearing + Distance option. Now click on the point of the island for which the bearing and distance were taken from the radar. 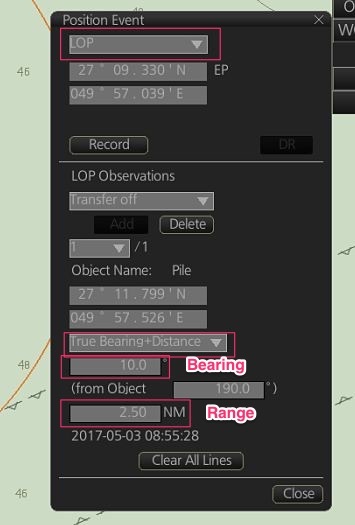 Now enter the bearing and distance in the position event window and then click “Add”. This will give you your position. 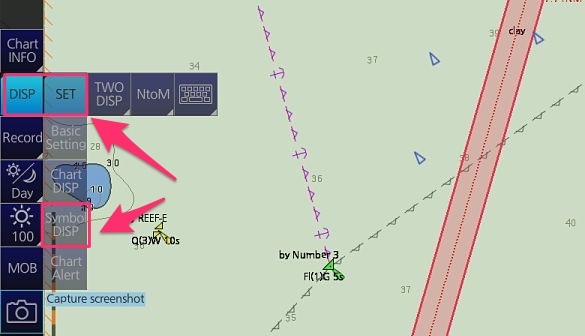 Now if you wish to record this position in the memory of ECDIS, click “Record” in the position event window. The position will be plotted on ECDIS and recorded in the memory. 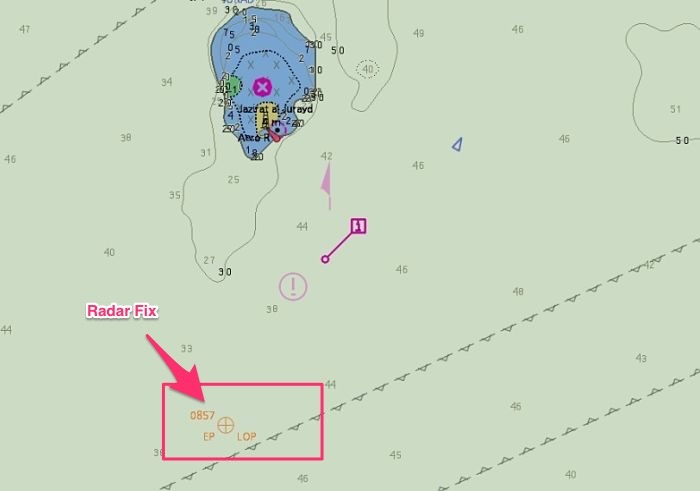 If we have two bearings (or two range) of two objects, the process of plotting radar fix on ECDIS is same as above. Just instead of “bearing + Distance”, choose “bearing” (or distance) option. Visual fixes are least practiced position fixing method inspite of being accurate. All it requires is a visual target and compass for taking its bearing. If we have two objects that are visible from the ship, the bearing of these two can get us the ship’s position. For a better accuracy of position by two bearings, the two bearings should neither be too narrow nor too wide. Separation angle close to 45 degrees being the ideal one. To plot the position by visual bearings of two objects, take the bearings of both the objects simultaneously. Now draw the bearing of these objects on the charts. 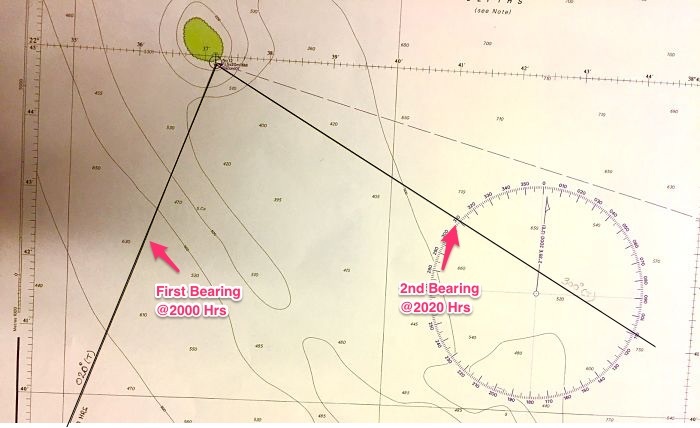 The point where these two bearings (position lines) intersect will be the ship’s position. How to do this on ECDIS ? The process is same what we did for plotting radar fix on ECDIS. Even when there is only one object visible for visual bearing, we can still get the position. The method is called “running fix”. In this method, we take the first bearing of this object before when it is forward of our beam. Let us say we see a light Fl 5s 20m 16M. At 2000 Hrs we take its bearing and it comes out to be 020 degrees. Plot it on the chart. This is the first position line at 2000 Hrs. Take the second bearing of same object when it is abaft the beam. Say this time we take the bearing at 2020 and the bearing is 300 Degrees. Plot it on chart. This is the position line at 2020 Hrs. Now we have two position lines but both are at different times. We need to bring either of these position lines to the same time as the other one. We know our course made good and speed, plot the this on the chart. Now on this course line cut the distance covered in 20 minutes which is the interval between two position lines. Let us name this point as point A. 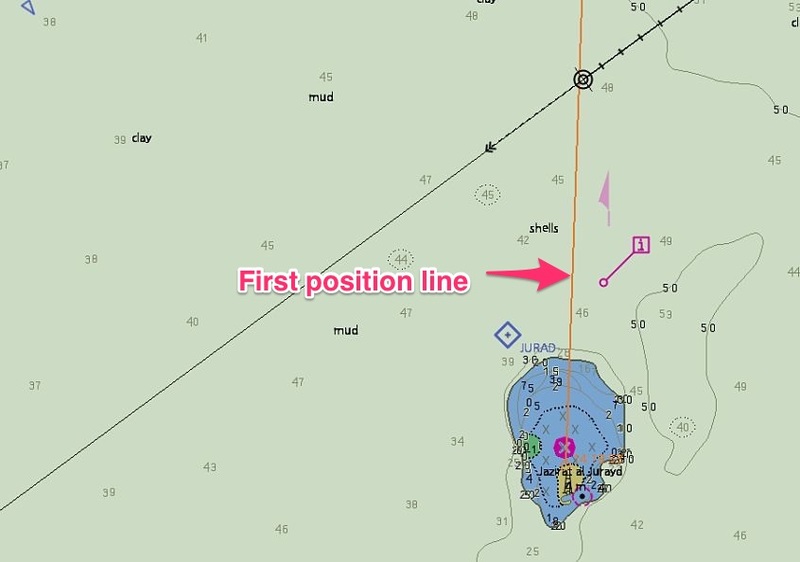 Now transfer your first position line to the point A. 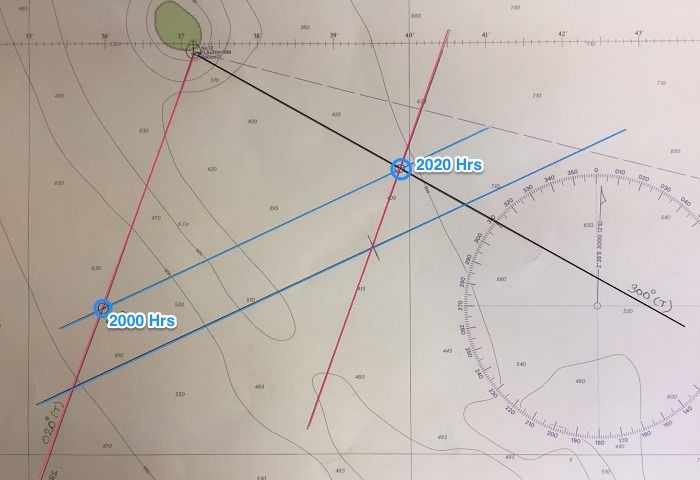 The point where it cuts the 2nd position line is the ship’s position at 2020 Hrs. This is because now both the position lines are at same time. To get the position at 2000 Hrs, draw your course made good from the 2020 Hrs position. 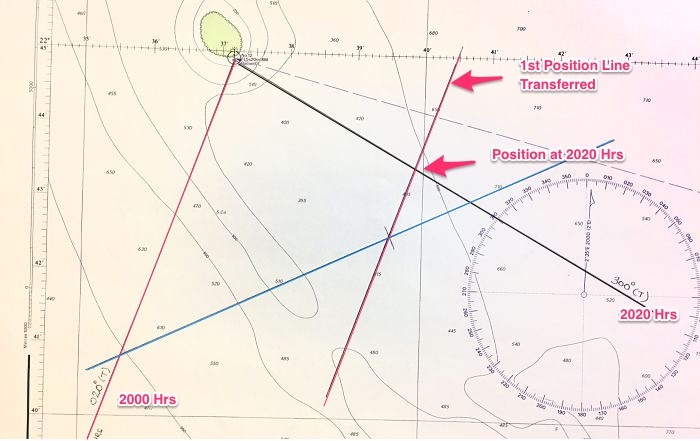 The point where it cuts the first position line will be the ship’s position at 2000 Hrs. 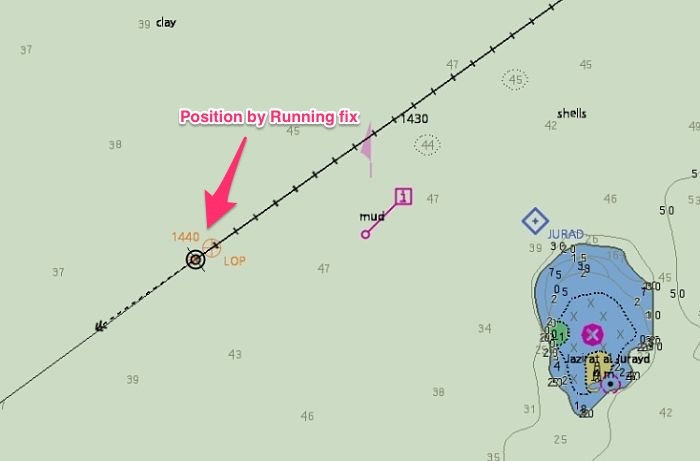 How to get running fix plotted on ECDIS ? Let us plot this on furuno ECDIS. 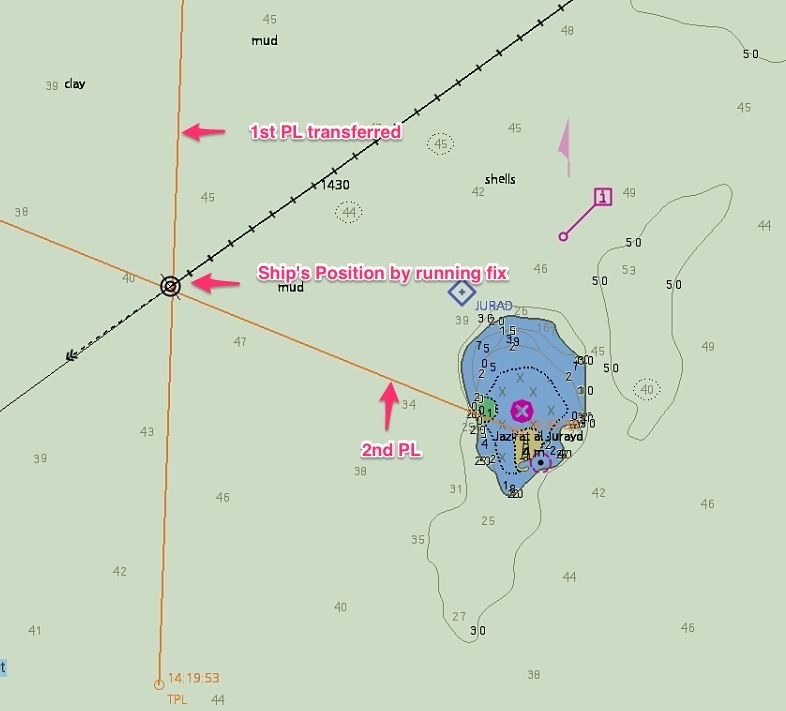 We take the first bearing of the fixed object and we plot first position line on ECDIS. To do that from the left menu options go to Record -> Event log -> Posn event. This will show a pop up called position event. Mark the first position line of the fixed object that you have taken the visual bearing from and click “add” to add the position line. Now when you have the 2nd bearing of the same object, mark the 2nd bearing on the ECDIS in the same way. Make sure the option “transfer off” is slected while marking both the bearing. So we have the two position lines but both are at different times. We need to transfer the 1st position to the present time to get a fix by “running fix” method. 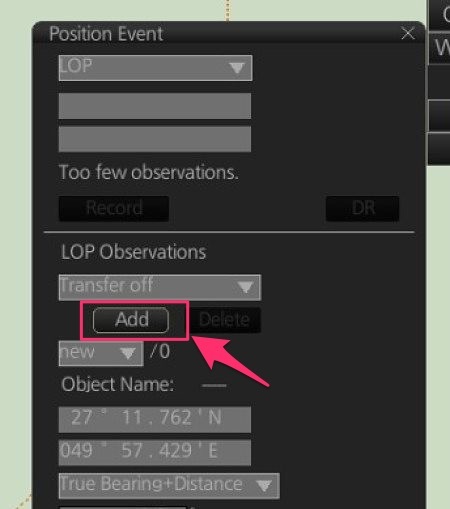 To do that, choose the position line number 1 from the position event pop up (under LOP observations). Then change the option to “Transfer to latest”. 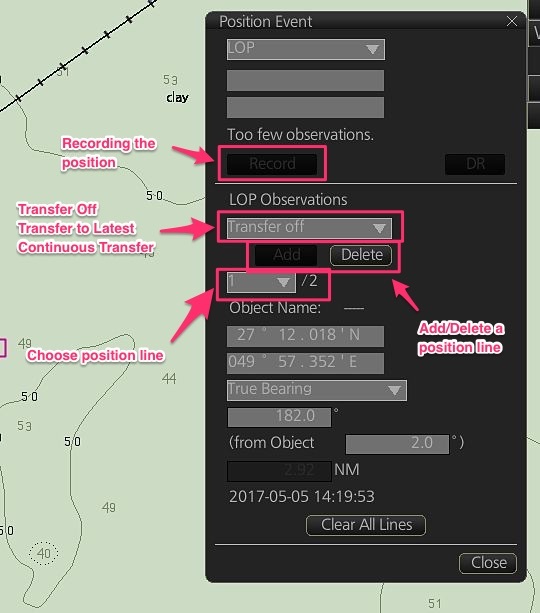 Once we choose “transfer to latest” option for position line # 1, this position line will be transferred to the latest time. You will also see TPL marked on this position line which denotes “transferred position line”. The position where it cuts the 2nd position line is the ship’s position. The position where it cuts the 2nd position line is the ship’s position. 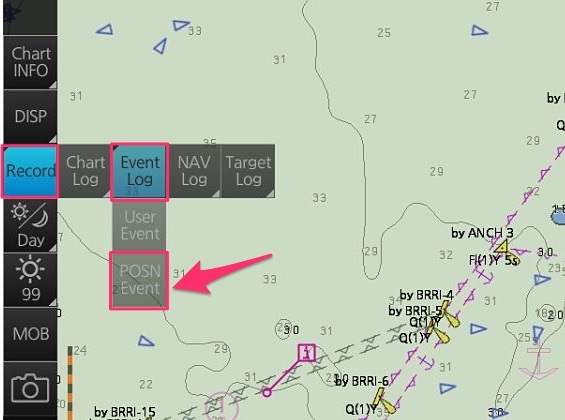 To record this position in the history data of ECDIS, just click on “record” option in the “position event” pop up. 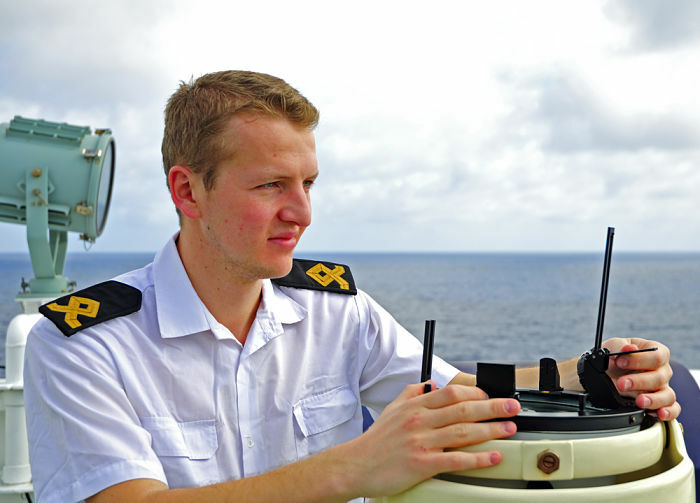 This will mark the ship’s position on the ECDIS and save it in the history data. I am sure not many discuss this as the position fixing method. Rightly so. We have so many resources and we do not need to rely on echo sounder for position fixing. But as I said, when the GPS fails we start doubting everything and each equipment. More methods of reassuring us about position can be handy. Echo sounder cannot be used as a position fixing tool but it can be used to confirm the known position of the ship. Have a look at this photo. This could be one of the place where we can ascertain our position by echo sounder. If we see depth of around 40 meters on echo sounder and at the same time we take bearing of the edge of the island that is visible to us. We draw position line from this island. As there is only one point on this position line where the depth is expected to be around 40 meters, this will be our estimated position. As I said this is not the position fixing method. But we can use this as a confirmation tool for the position we get from other methods. We earlier discussed that the interval between two position fixes should be such that between any two fixes, the vessel must be safe. 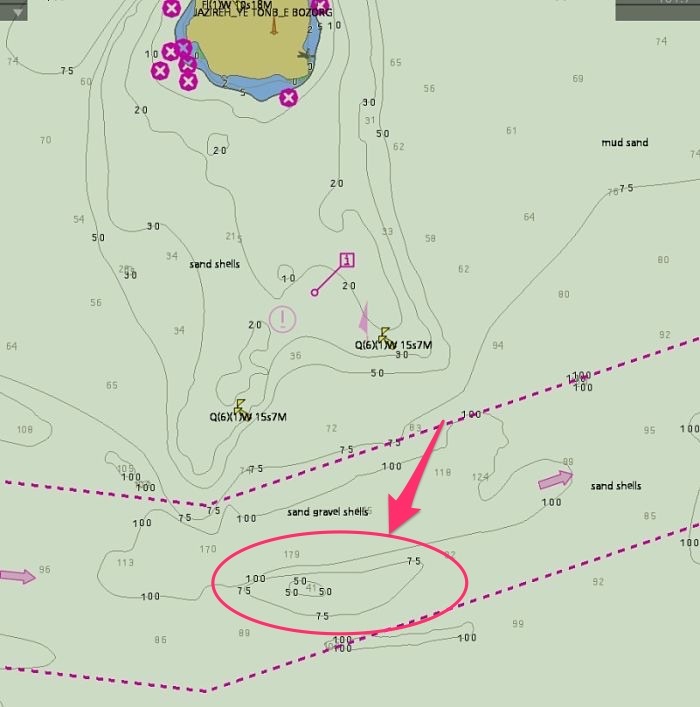 But this would mean that during arrival into a port, we need to plot our position every 60 seconds. Many, including some third party inspectors may insist on this but this is crazy. Imagine plotting the radar fixes every two minutes. Sometimes even the chart would not be of such large scale that can distinguish the two positions plotted at two minutes interval. I feel PFI of less than 5 minutes is not practical. So how do we ensure ship does not run into danger if PFI need to be less than 5 minutes and we plot the position every 5 minutes ? The answer is by “parallel indexing”. We identify a fixed object and draw a line parallel to our course. We then monitor the echo of this object on the radar. If the echo stays on the line drawn parallel to the course, we are on our course. If the echo deviates from the line, we are off track and we must alter the course to bring the vessel on track. This is a method which ensures continuous monitoring of the ship’s position. 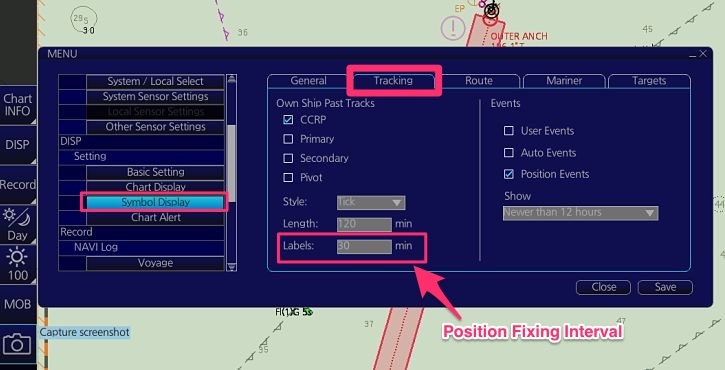 In the situations where PFI comes out to be less than 5 minutes, we can set the PFI as 5 minutes and then monitor the ship’s position by parallel indexing and plotting the position every 5 minutes. 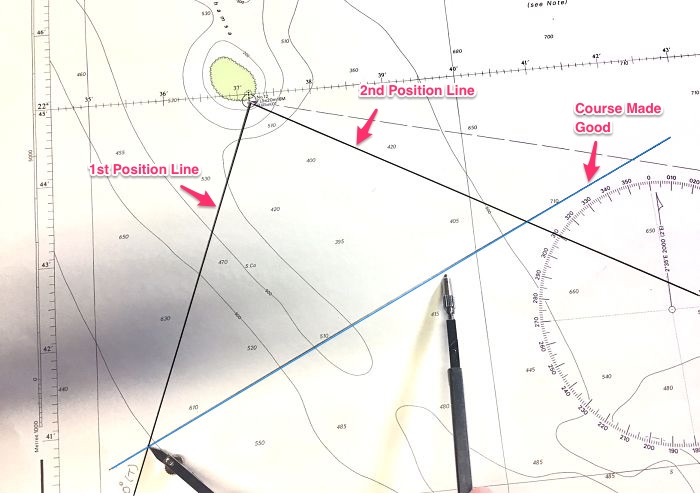 Parallel indexing is a fantastic tool for monitoring the ship’s position. For this reason, it must be used wherever a radar conspicuous object or landmark is available. Sadly most of the groundings happens because we either do not know one of these or both. If we know all the methods of plotting and then confirming our position, we will never miss out where we are. With now more and more ships going paperless, we must also transform ourself to be able to use these methods on ECDIS. A very good effort sir. Very crisp and simple to understand. thank you for this sir, how about plotting celestial observation in furuno ECDIS? An excellent and understable way prsented.You must be in teaching business. Please meet another old teacher.Do keep in touch. Thank you Sir. No, I am not into teaching. I am just trying to give the salt back to sea..
Glad you found it useful Raman..
Sir, Excellent effort ....for made simply understand..Thank you very much, Sir. Dear sir, I would like to ask you that if you have time, can you write a post about the radar techniques in using to manouever the ship during the coastal navigation. I really like it and as I know the ability of the 2nd mate will be identified through his using radar technique. Thanks in advance. Many thanks Capt. Rajeev, excellent piece. Allow me a question please. VIQ states that parallel indexing should not be used with floating objects, but what about clearing bearings? I see that many navigators use Clearing Bearings with buoys. Is that acceptable? 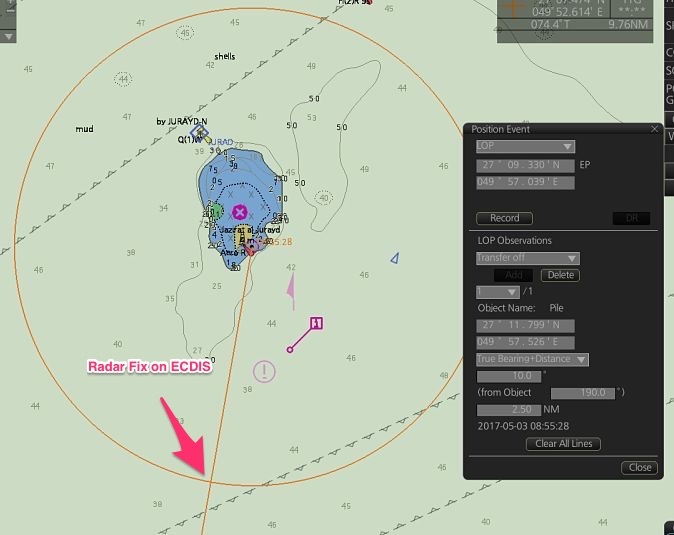 do we need to put pfi intervals on ecdis chart as well as it is being done by the use of gps labels on ecdis? 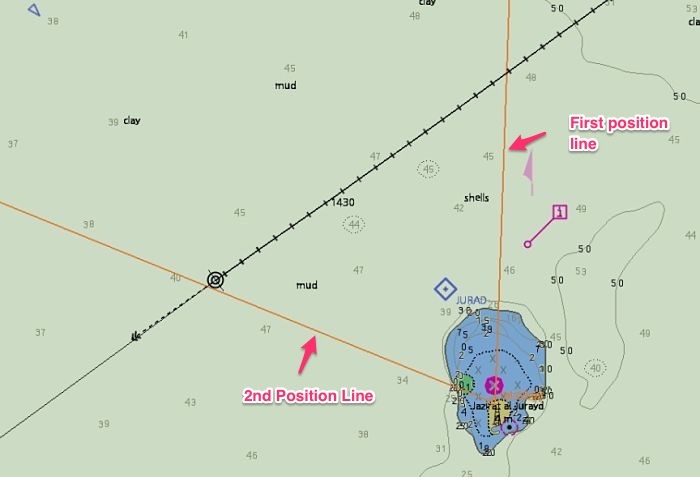 For instance i am getting time label of 10 mins each on my ecdis track and hence i am monitoring my position continuously still do i need to put pfi interval on user map? Sir can we plot radar bearings directly to chart? Hi, how do we input celestial observation or position in the ECDIS? how would i find out position plotting interval for a leg?